This is hands down my absolute favorite recipe for green beans! 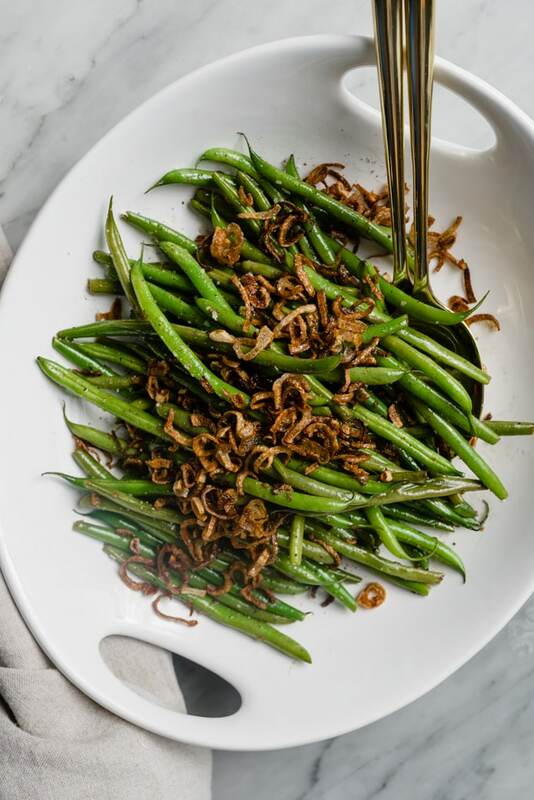 If you love green bean casserole, but can’t be bothered with the fuss, these garlicky green beans with crispy shallots are your new side dish BFF. 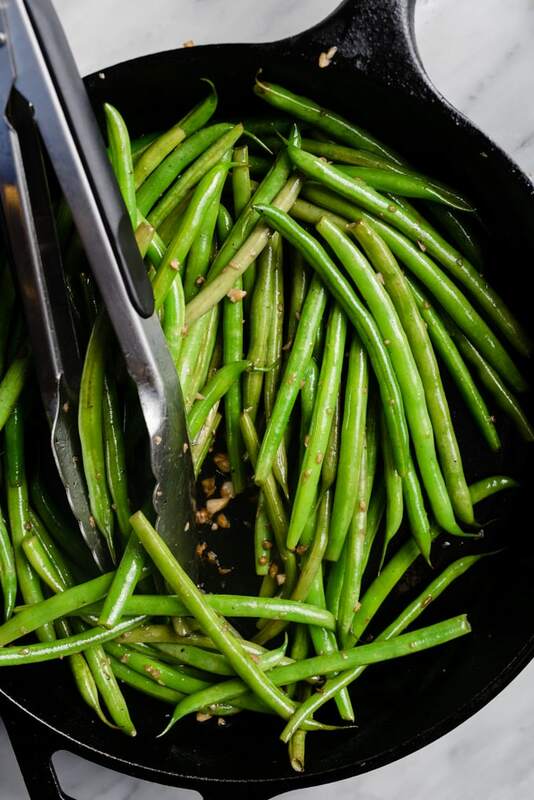 Tender french beans are sautéed in garlic, seasoned with cider vinegar, then topped with smokey, crunchy, caramelized shallots. You’ll find a million occasions to serve this easy, flavorful side dish. Green beans are one of two green vegetables my kids devour without complaint (the other is broccoli). We call them “nature’s french fries”. Sadly they’ll only eat them one way: steamed then slathered with butter and salt. I like me some butter and salt as much as the next gal, but night after night? BO-RING! So every once in awhile I make these adult-style green beans. Fancy schmancy french green beans. 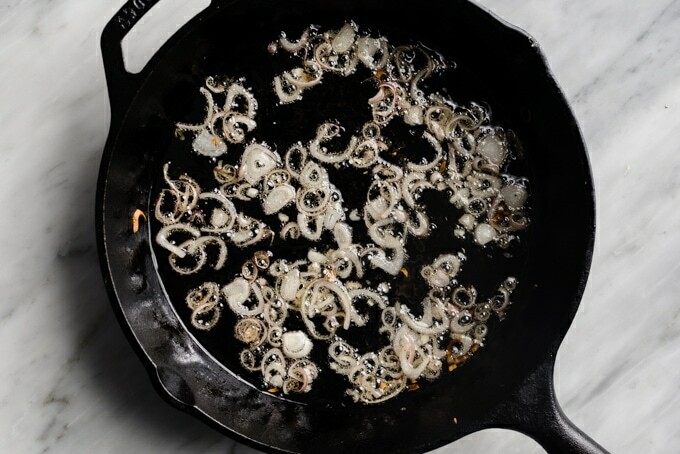 Sautéed in garlic, seasoned with cider vinegar, and topped with crispy shallots? Oh my, oh my, oh my! They’re heavenly. These garlicky green beans with crispy shallots encompass the best of green bean casserole with none of the fuss. They’re bite tender and crisp, and so incredibly flavorful. A little bit spicy from the garlic, a little bit smokey from the shallots, and perfectly balanced with a splash of cider vinegar. Nature’s french fries? OH HELLS YES. >>> Pin it now! 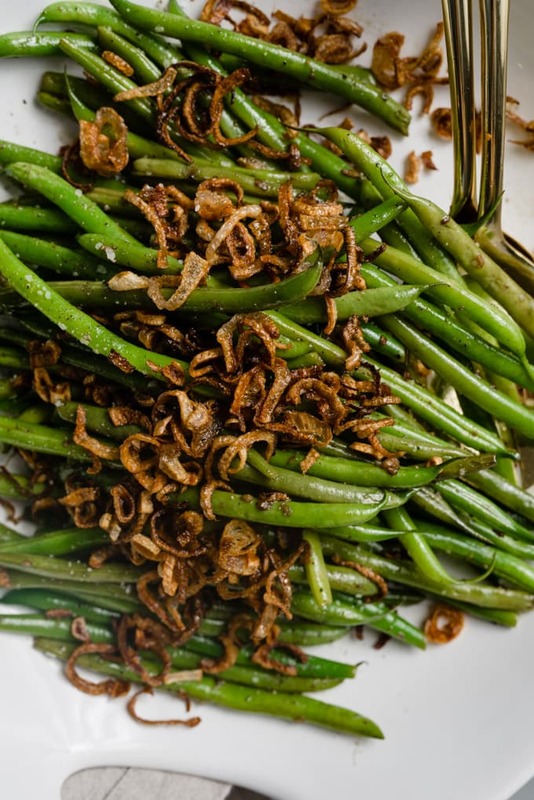 Click here to save this recipe for garlicky green beans with crispy shallots to your Thanksgiving board on Pinterest. Crispy fried shallots add so much flavor to garlicky green beans. They’re a little bit sweet, a little bit smoky, and delightfully crunchy. They bring just enough punchy onion flavor to keep things interesting, without overpowering. Let’s slice some shallots! Trim the ends, remove the papery outer skins, then slice in half lengthwise. Place the shallot cut side down, then slice widthwise into thin slices – about 1/8″ thick. Heat about a half a cup of olive oil in a 10″ cast iron skillet over medium heat until shimmering. Test the oil to make sure it’s hot enough by adding a shallot or two. The shallot should immediately sizzle and start to bubble once it hits the hot oil. No sizzle? Not ready. Wait another minute or two. Once the oil is ready, add half the shallots to the oil, then distribute them into an even layer in the pan using a wooden spoon. Fry the shallots, stirring them every few minutes, until they’re lightly golden brown. 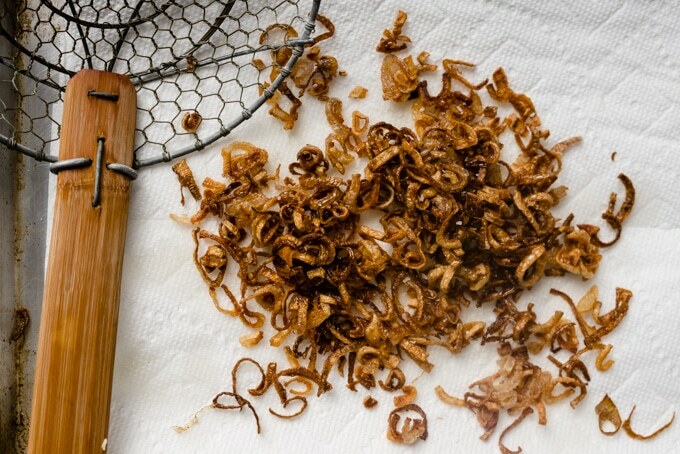 Remove the shallots from the oil using a spider strainer (wire skimmer) or slotted spoon, place onto paper towels to drain, and season with a pinch of sea salt. Then repeat with the remaining shallots. I bolded and italicized “lightly” up there for a reason – it’s an important note! Cook them any longer and they’ll taste burned. The shallots will continue to cook a bit more in the hot oil even after you’ve removed them. Watch them closely, and remove once they’re the color of light brown sugar. They’ll deepen a bit as they cool and crisp. If you want to make these in advance, go for it. Let them cool completely (it doesn’t take long), then loosely cover with a paper towel. They don’t last longer than a day, so at most make them in the morning to use later in the day. I like to use french beans, or haricot verts if you like to roll fancy-style (that’s literally just french for “green beans”). French green beans are smaller, sweeter, and more tender than normal “string” beans, and they cook in about half the time. They’re a little bit pricier, but they make up for that with superior flavor. Add some minced garlic to the hot oil and sautee until it’s fragrant, about a minute. Then add a tablespoon of apple cider vinegar and the green beans. Quickly toss the green beans in the hot oil, garlic, and apple cider vinegar until evenly coated. Keep sautéing the green beans for another 2-3 minutes until they start to char just a bit. Then add a quarter cup of water, cover the pan, and steam them until they’re crisp, and the water has evaporated – another two or three minutes tops. The green beans should still be bright green, and bite tender with a bit of crisp. Perfection. Add a bit of salt and pepper, give them another good toss, then transfer them to a serving platter and top with the crispy shallots. This dish is packed with loads and loads of flavor while being naturally friendly to all of the diets! DID YOU MAKE THESE GARLICKY GREEN BEANS? I WANT TO SEE YOUR CREATIONS! SNAP A PICTURE AND SHARE IT HERE ON PINTEREST. 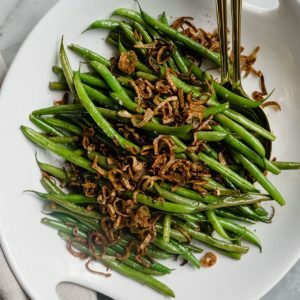 If you love green bean casserole, but can't be bothered with the fuss, these garlicky green beans with crispy shallots are for you! 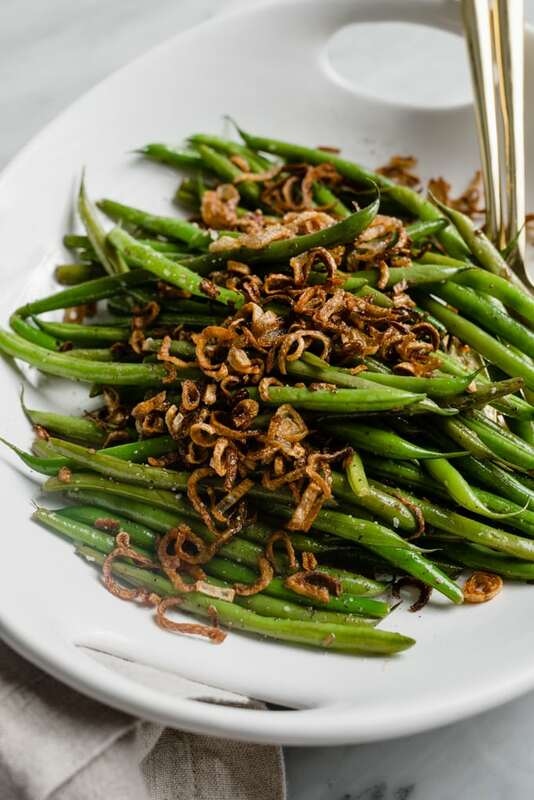 Tender sweet green beans are sautéed in garlic, seasoned with cider vinegar, then topped with smokey, crunchy, caramelized shallots. Line a baking sheet with several layers of paper towels. Heat a 10" cast iron skillet over medium heat. Add the oil and heat until it shimmers. Add half the shallots to the oil, distribute the shallots into an even layer with a wooden spoon, and shallow deep fry until lightly golden brown and crispy, about 7-8 minutes. Important - do not wait until they are a deeper golden brown! They'll taste burned. 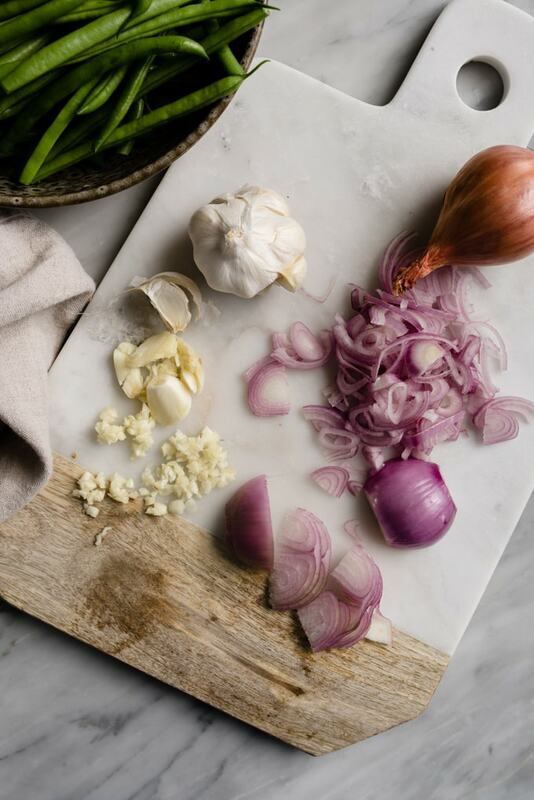 Remove the shallots from the oil using a wire skimmer or slotted spoon, place onto the paper towels, and immediately sprinkle with a pinch of salt. Add the remaining shallots to the hot oil and repeat. Pour all but 1 tablespoon of oil from the skillet, then return the skillet to the stove and increase the heat to medium high. Add the garlic and saute until fragrant, about 1 minute. Add the apple cider vinegar to the the skillet, immediately followed by the green beans. Toss with tongs to coat the green beans in the fat and vinegar. Sautee the green beans, tossing frequently, until bright green and slightly charred, 2-3 minutes. 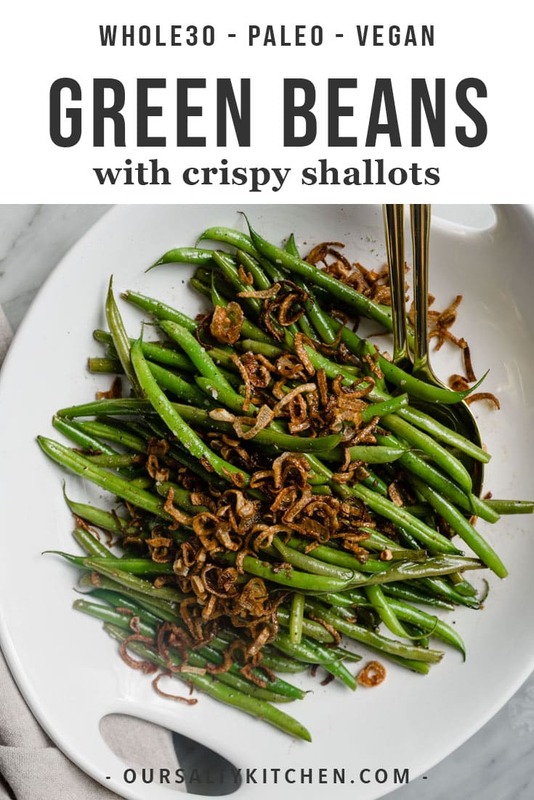 Add ¼ cup water to the skillet, cover, and steam until the water has been completely absorbed and the green beans are crisp tender, 2-3 minutes. Season with salt and pepper, and toss to distribute the seasoning and garlic. Using tongs, remove the green beans from the skillet to a serving bowl and top with the crispy shallots. Serve immediately.